It’s hard to believe that today we celebrate the 300th article from Trev’s Bistro in its barely over a year old lifetime. Cheers to 300 more articles celebrating and discovering all there is in the wonderful wide world of eating and drinking! For this Bites of the Week issue, we present a little bit of San Francisco and a healthy dash of Los Angeles, with no shortage of spring peas and spring onions. Plus, summer stone fruit are arriving. That’s a very good sign. You’ll enjoy these bites almost as much as I did. Here is a tour de force of salad artistry, balancing classical decadent crunch and luxurious cream, with the ripest and freshest California produce bounty. Literally, I was informed this was the first day of the season for apricots impressive enough to use in a salad. If day one is any sign, we’re in store for quite the apricot summer. Even the dressing had just the right amount of ripe apricot sweetness in the mix. The butter lettuce? It makes a case why every salad should use it as a base. Cheers to apricot season! 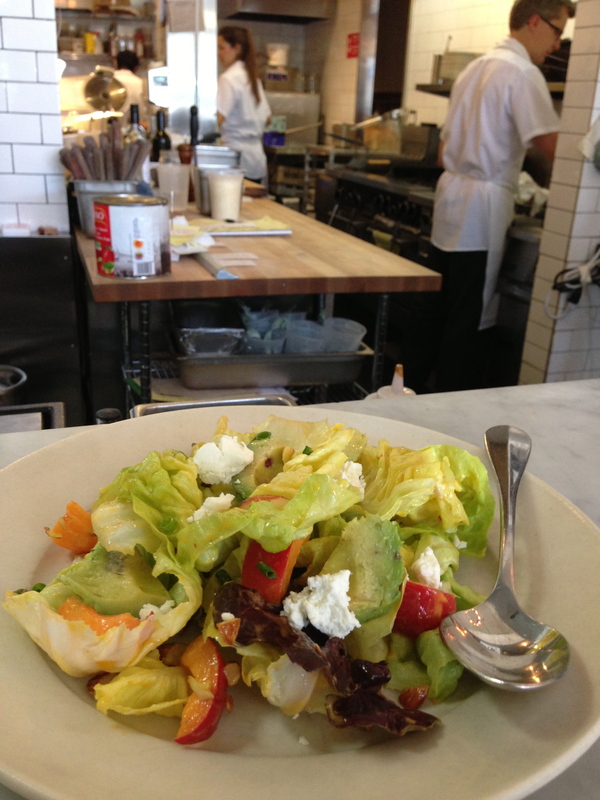 Oh, with all this salad talk, let’s not forget Gioia happens to be one of the best pizzerias in San Franciso. The Russian Hill pizzeria crafts top notch very New York style pies and slices, complete with the right tinge of grease. You want the stellar salt-spice blast of the “Acciughe” with Sicilian anchovies, Calabrian chiles, and oregano. It’s the perfect mate to the calm as a summer breeze salad. 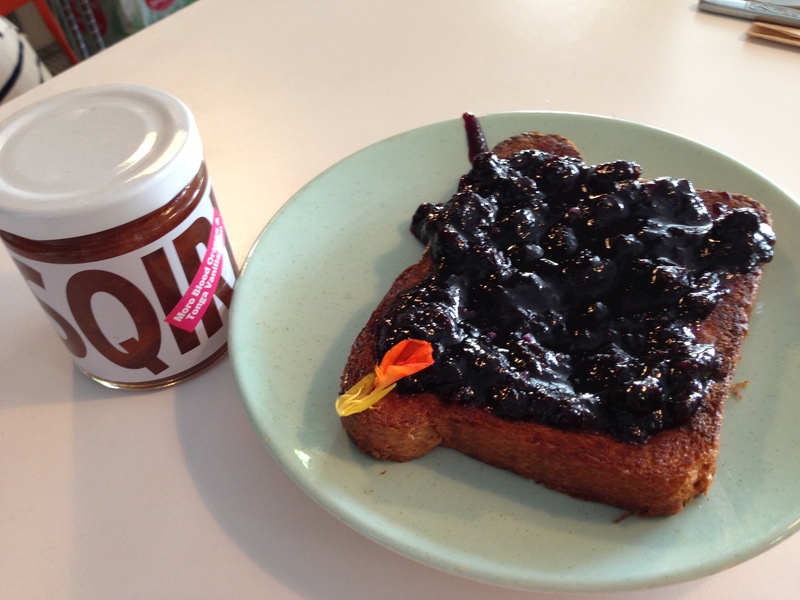 Squirl’s jam and toast…it’s transcendent jam and toast, believe me. Sang Yoon hasn’t been cooking burgers his entire career. That’s not really what you do learning from Gray Kunz at the old Lespinasse or during an apprenticeship in Paris with Joël Robuchon. There is a whole menu of tapas, small plates, and even a few larger plates at Father’s Office that goes well beyond The Office Burger. Yes, trust me, there is. It just seems 99% of diners don’t seem to notice. Remember, Father’s Office started as a tapas bar. Diners need to go beyond the renowned burger with the smoked eel crowned by a poached egg and horseradish crème fraiche, or this terrific tender lamb skewer with a perfect char and cumin- heavy seasoning. Everything clicks together, especially the cooling mint and yogurt. Even the pickled cucumbers will make you forget about the burger. There is no single burger in the entire world that has received more attention than The Office Burger at Sang Yoon’s pair of West LA gastropubs. Amidst thousands of imitators now, it’s The King. It’s a little bit like what life must be like for LeBron James. The hype is so overwhelming that you literally cannot live up to it. So, you won a championship? I’m still not impressed. Go solve world peace (and I don’t mean the Lakers player). I actually devoted an entire chapter of my college thesis to The Office Burger a few years ago, explaining (in French) how the humble burger sandwich had become such an art form with little tweaks by a classically trained chef at his neighborhood Santa Monica bar. You know the deal about no substitutions. No ketchup and mustard. The dry-aged beef adds excellent depth and juice to each bite, with a gorgeous outer char from being charbroiled instead of griddled. However, it’s Yoon’s brilliant French Onion Soup- inspired combination of arugula, the two contrasting cheeses, and most importantly, the caramelized onions that help The Office Burger reliably live up to its reputation. I said this after my first trip a while back to Father’s Office and I still say it today: everything is perfect about this burger except the partially stale, bland baguette. There has to be a better baguette in Los Angeles to use. Look past the baguette and indeed, it’s a work of art, especially when paired with an Allagash Tripel and the miniature shopping cart of sweet potato fries and a roasted garlic- Cabrales blue cheese aioli for dipping. Now if only the food runners would ever smile…it’s all part of the Father’s Office mystique. Dessert at Father’s Office? 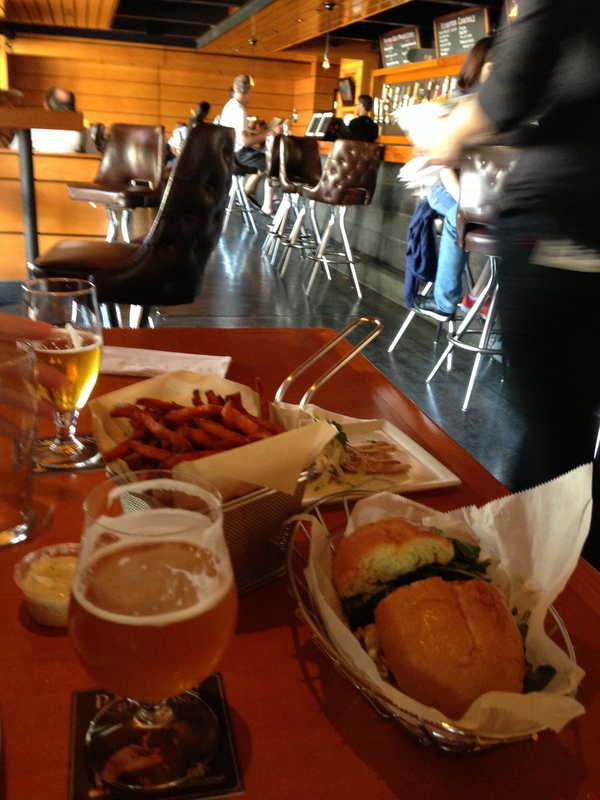 How have you not filled up from the burger, fries, and enough beers? No visit to either Father’s Office location had the subject ben acknolwedged until a recent visit when I noticed a $3 sticky toffee pudding. I thought it must be a petite pudding for the price. Not so. This could stand proud in London. Then I remembered hearing that Yoon teamed up with Sherry Yard (of Spago and Wolfgang Puck empire fame) to re-launch the Helms Bakery (Father’s Office in Culver City resides in a complex known as the Helms Bakery. There used to be an actual Helms Bakery, but it closed years ago). The Yoon-Yard Helms Bakery 2.0 is still not open for retail/cafe business as far as I know, but Yard’s simple, homey desserts are now appearing at Father’s Office. Here is a spot on sticky toffee pudding, every bit as jolly as the city’s best at the nearby Waterloo & City. The $2 scoop of vanilla ice cream almost costs as much as the the pudding itself, but à la mode is a necessity for all of that caramel sauce. Plus, it’s very good vanilla ice cream, a phrase I don’t use very often. Ari Taymor’s cuisine is provocative as well as refined. Each dish pushes the envelope without losing sight of what it really is at its core, a philosophy exemplified by the exquisite pastas you may have at Taymor’s prior post, San Francisco’s Flour + Water. Now on his own in a not- as- refined- as- the- cuisine space on Downtown Los Angeles’ South Broadway strip where not much seems to be happening at night, Taymor is captivating the Los Angeles dining public with his imagination. Even an early summer red fruits bread pudding for dessert gets thrown for a savory spin with the bread being rye bread. Goat milk becomes a dressing for spring alliums (spring onions and sweet as spring turnips), thumb sized kumquats, and coffee granola that gives new meaning to the term coffee grounds. Dungeness crab and summer squash pair for a fascinating late spring salad with basil and almond milk. A smoked garlic béarnaise and snails add new dimensions to the tried and true New York steak. Even rice grits aren’t just another bowl of porridge, here vying for time with shiitakes, peanuts, Brussels sprouts, and a fried egg in hangover dish gone epicurean. 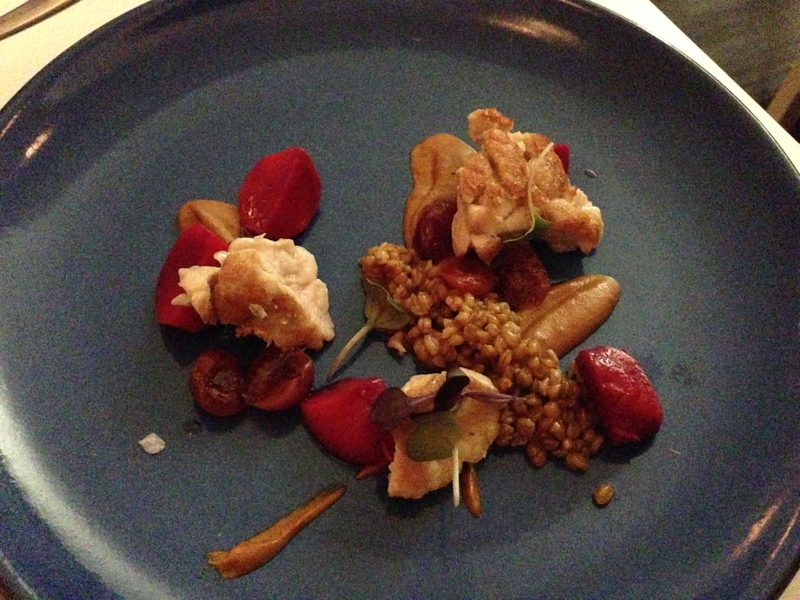 Best was a sweetbreads masterpiece in every way. 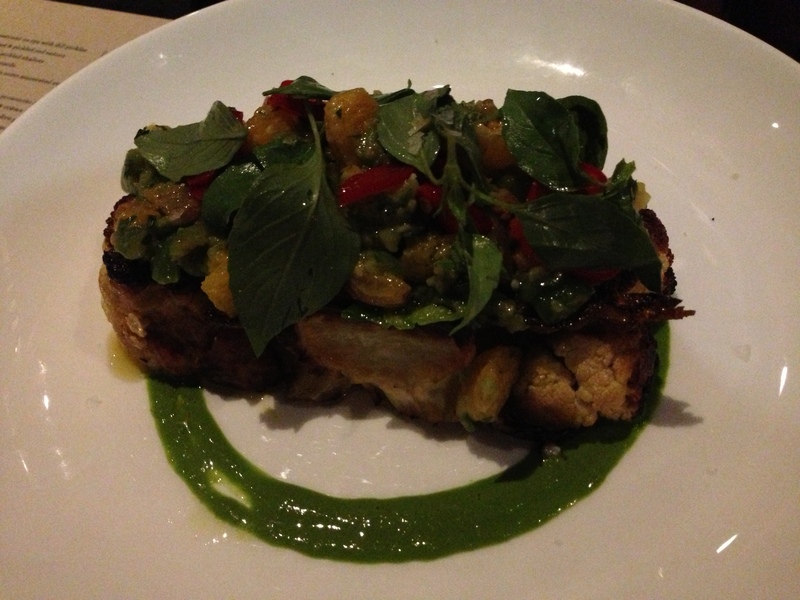 The sweetbreads have a perfect thin red sear, with a glistening caramelized exterior. The creamy texture has just the right softness without losing structure to be a bit steak- like. Plump Bing cherries and cubes of beets provide refreshing counter-punches to the soulful dollops of mole, where spices, cacao, and earth awaken every sense. A truly forceful dish. Bread and butter, eh? This is a classic example in defense of Frank Bruni’s argument years ago in The New York Times that restaurants should charge a few dollars and bake their own bread and serve it with thoughtful accompaniments, instead of forgettable bread with lifeless butter. I couldn’t agree with him more, especially if chefs take the plunge and followed Taymor’s lead. The housemade bread at Alma is two forms of bread: more of a sweet wheat levain and heat- nudged English muffins. Yes, English muffins that melt when touching the soft profound butter. What else do you expect at a restaurant with yellow binder paper as the menu’s base? 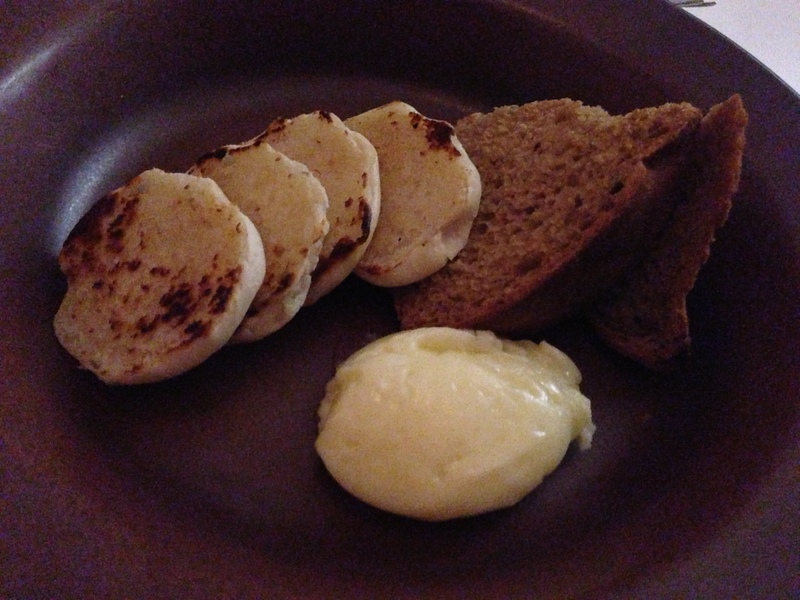 Of course there would be a quirk to the bread plate. It’s one of the few dishes always on Taymor’s menu, along with the beautifully briny seaweed and tofu beignets that are a study in how the yuzu kocho condiment can make anything transcendent. Taymor has a way with bread dishes period, whether it’s the toast with the Mount Olympus of salty flavor trinity of uni, burrata, and caviar, or an astounding brioche toast layered with date jam, then slathered further into joyous layers of chicken liver. 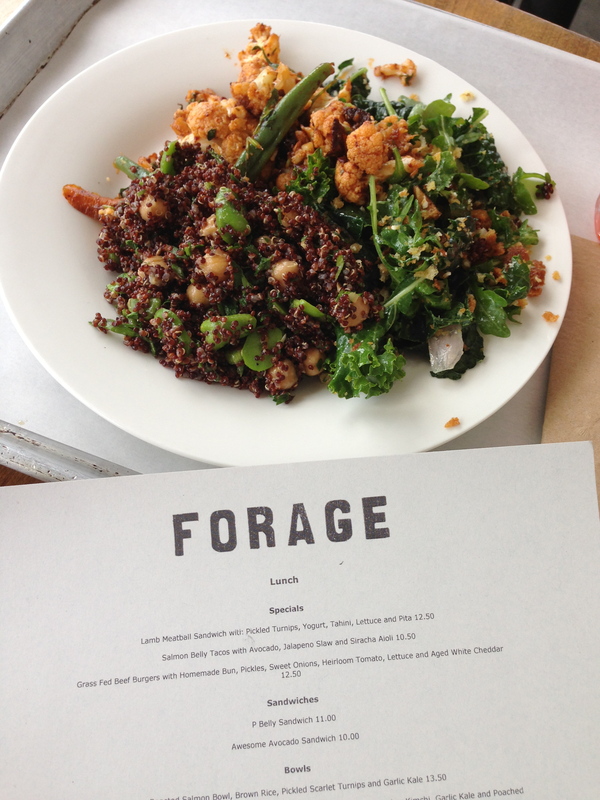 I could eat lunch five days a week at Forage. Everyone seemed to be loving the salmon belly brown rice bowls and the burger (what restaurant in LA doesn’t have a good burger business?). Really though, in the heart of Silver Lake where studio execs, artists, hipsters, musicians, and joggers still in workout gear all converge at Forage, you want the salads (known as “sides”). All your favorite yoga generation detox buzzwords are there. Yet, they somehow far surpass anything at Whole Foods or even Urth. I couldn’t get enough of the velvety carrots and gorgeous crisped cauliflower in a harissa bath, or the fava beans in their prime tossed with red quinoa, artichoke heart segments, and chickpeas. The cavolo nero (a form of kale) and arugula salad grew a tad boring, but those herb intense toasted breadcrumbs were a showstopper. Yes, the breadcrumbs. Good carbs. David Myers and Kuniko Yagi are showing a mastery of marrying myriad elements from around the globe with the essential standards from across Asia, such as the chili crab toast or the Sambal skate wing below. This is the opposite, where the curry infuses the mayonnaise and the basil garnish change the classic New England summer dish. The stained “hot dog bun” involves charcoal incorporated into the flour. 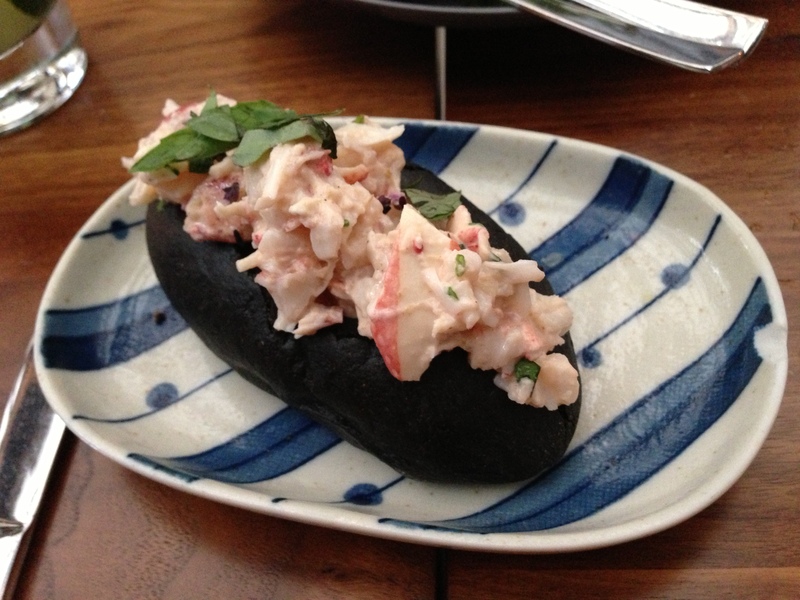 I’ve never found a lobster roll like this in the rough along the Maine seashore. It looks like melted cheese, but it really is an otherworldly chile paste gone crazy with fish sauce nudging the spices in the fish’s coating. 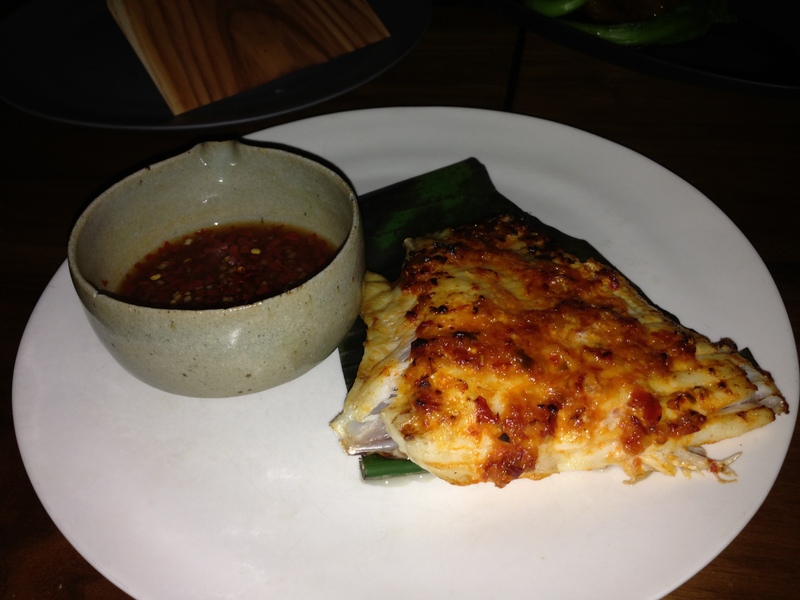 The skate comes on one side of the bones, then flip it over and resume alternating between plain bites and bites dipped in the fiery sambal sauce. The story here is that exceptional marinade/ sauce. I can’t begin to imagine how many experiments it took Myers and Yagi to perfect this. The ramen debates of the Bay Area are intense, almost like discussing the most deserving start-up for your VC firm to give seed money to. But it seems that those who continue seek ramen greatness largely laugh off the options in the actual city of San Francisco. 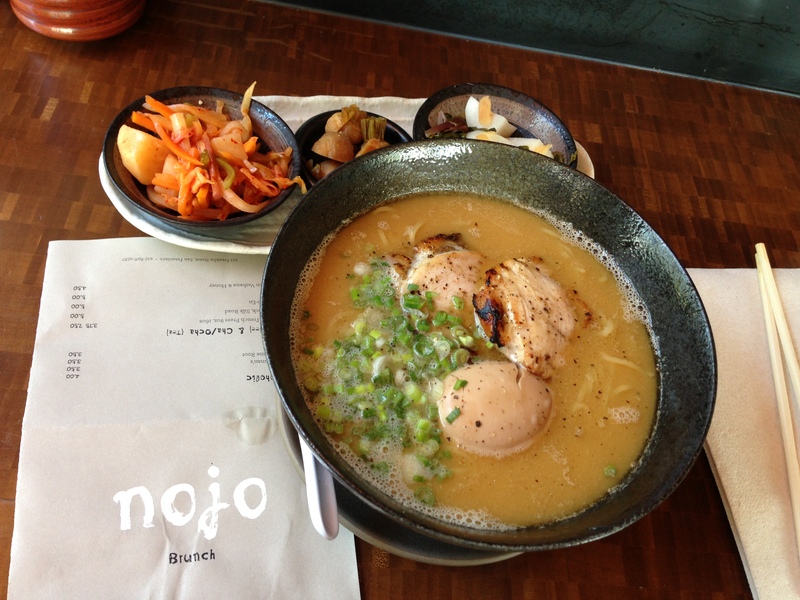 There is one masterful option at least on Sundays at brunch, courtesy of Greg Dunmore at his much more than an izakaya in Hayes Valley, Nojo. 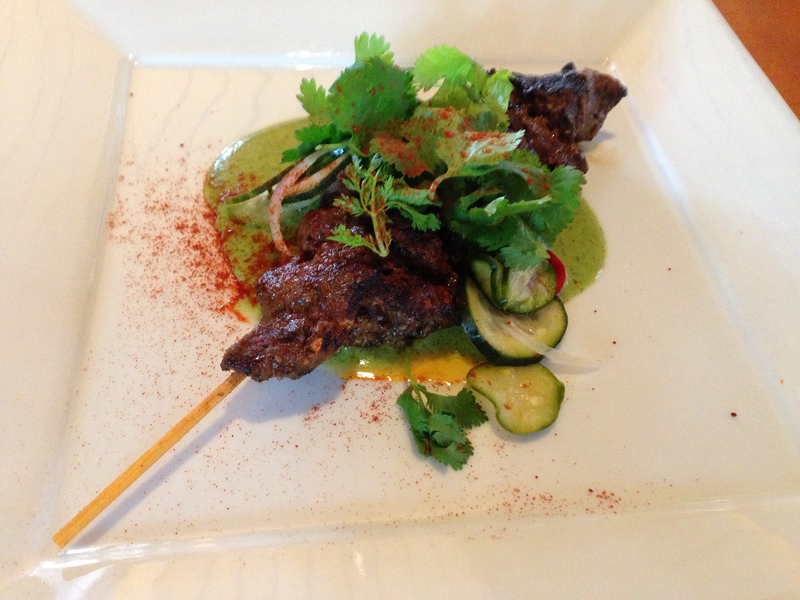 I had only enjoyed the yakitori and assorted other beautiful works from Dunmore at dinner before this recent visit. I’ve never warmed to the cold, austere space that completely doesn’t echo the pristine creations by Dunmore. The Nojo Sundae easily made me forget about the dining room at dinner. The ramen certainly did too at sun-filled brunch. Now, this intense, enlightening ramen will be a Sunday staple for yours truly. Even the chicken confit manages to be an exciting pork belly confit without the grease. The noodles are on point, soft yet springy. Slurp after slurp, it’s all about that chicken shoyu broth. You’ll find it to be almost as thick as caramel and the egg patiently waits in that broth, tempting you to go for that bite to release its slightly runny yolk splendor. 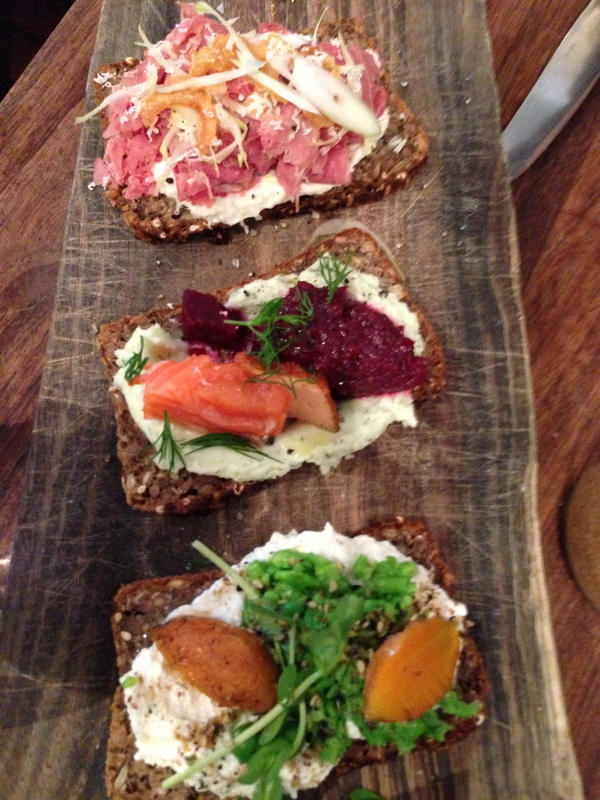 Here’s your monthly Bar Tartine smørrebrød update, about as common a site on this website as beet cocktails (Bar Tartine has a terrific candied beet Mimosa…). The quark cheese (think a less salty burrata or more robust sheep’s milk ricotta) option always ends up being the leader of the day, this time given a spring jolt from pea shoots, whole peas, and smashed peas. The pair of curried carrots on top were the “cherries on top” if you will. Wild King salmon is in its prime now too, here teaming brilliantly with a potato mousse and flecks of dill. Both the salmon and beets appear in two ways. The fish is both tartare and crisp skin (what an umami blast) and the beet comes as a pickled square and a confiture. The one misfire, frankly the first I’ve ever found period at Bar Tartine, was the dry corned beef. Potato crisps and horseradish tried to remedy matters, but meat that lacks moistness lacks character. Luckily, there is always the chocolate buttercream and hazelnut smørrebrød for dessert. It never fails to improve my day. While I have all wonderful things to say about Michael Voltaggio’s adult dining room Ink, unfortunately I can’t quite throw positives around as effortlessly about its next door little brother, Ink. Sack. The concept is great, with creative sandwiches given the slider treatment. Think two to three sandwiches equals one traditional sandwich, depending on your sandwich size point of view. Nothing missed necessarily, though many options were merely fine. In particularly, the nondescript bread really is off. It’s like what you’d find for a Hoagie at Subway. The cold fried chicken sandwich has little moistness inside or crunch outside, borrowing supporting elements from Chinese chicken salad with (too much) ranch dressing and Gindo’s Spice of Life hot sauce (barely any). “The Jose Andres” would please the chef just fine, but it is what it is with various cured hams and a thin layer of Manchego cheese. Lots of salt and oil with little excitement. No harm, no foul. The “Oreo Cookie” Cookie was the same– a fine soft cookie with Oreo bits in place of chocolate chips, but not as unique as an Oreo or satisfying as a very good chocolate chip cookie. It’s just surprising to see that gift for transforming nuances so evident at Ink to be largely vacant at Ink. Sack. 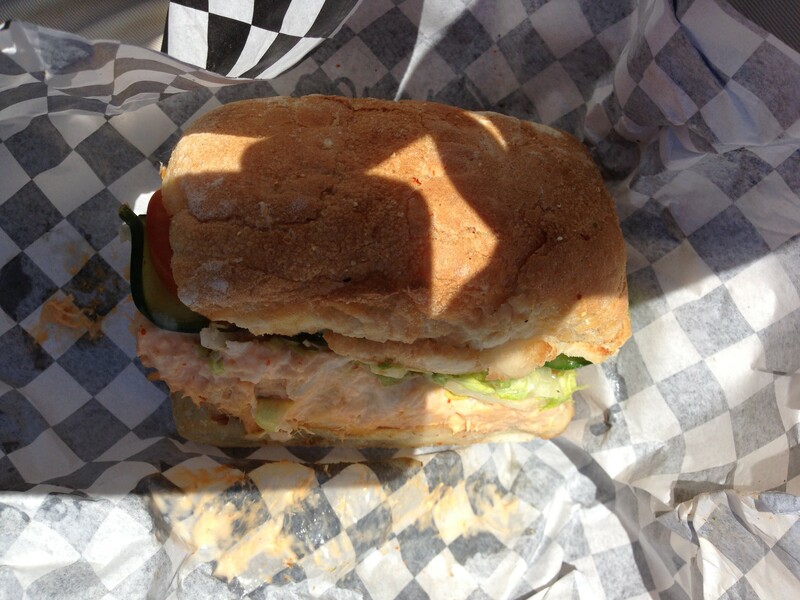 Except, in the terrific spicy tuna sandwich. Somehow the sriracha mayo and meaty albacore makes this end up tasting like a top of the line lobster roll with attitude. Do also try the chile and lime marinated pineapple. It’s got that finishing punch you’ve been hoping for all day from the sandwiches. There may be no more iconic dish of the moment with one of the most widespread movements of the day amongst chefs: to treat vegetables with the same respect often reserved for meat. It’s literal here, down to a T. George Costanza would fully approve of this vegetarian T-bone. What must be at least half a head of a full- sized cauliflower actually looks like a thick slab of steak. It kind of looks like sweetbreads to be honest with the white color. Like a great steak, the florets’ exterior achieves the perfect caramelized char, making the cauliflower both sweet and earthy. A swatch of parsley purée served as the mat for the cauliflower, leading you to the prized meat. The party really gets going with the sweet-salty tapénade on top of orange and olive. The two work in outrageous harmony with the cauliflower making for a dish every bit as satisfying as a Peter Luger porterhouse for two. I’m willing to fight in defense of that claim. Superba is best known for its cauliflower, but Jason Neroni’s young Rose Avenue hotspot really has imaginative pastas at its heart (called “From Our Hands” on the menu). Perhaps go spring- heavy with spring pea stuffed agnolotti, mint, sugar snaps, and poached shrimp, or try an idyllic, thick, definition of al denté smoked bucatini carbonara where you really taste the dough and smoke of the pasta, and the pancetta fortified parmesan cheese- black pepper- poached egg mixture screams with rustic pleasure. No carbonara I’ve had in Rome even comes close. 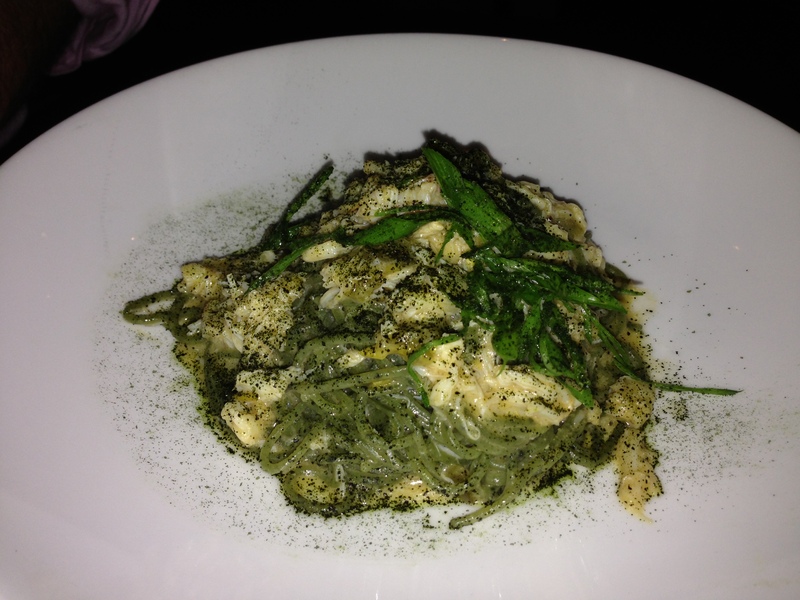 The night belonged to the seaweed-enhanced spaghettini, given further marine brininess from the uni and very generous morsels of Dungeness crabs. The miso butter lends the right sweetness and moistness versus the sour-spicy jalapeños. We can talk all day about the cauliflower T-bone, but this is the dish that truly exemplifies why Superba is much more than just a Venice snack bar. David Lynch’s young San Francisco wine bar/ gastropub is an essential destination for obvious hoppy and grape reasons. 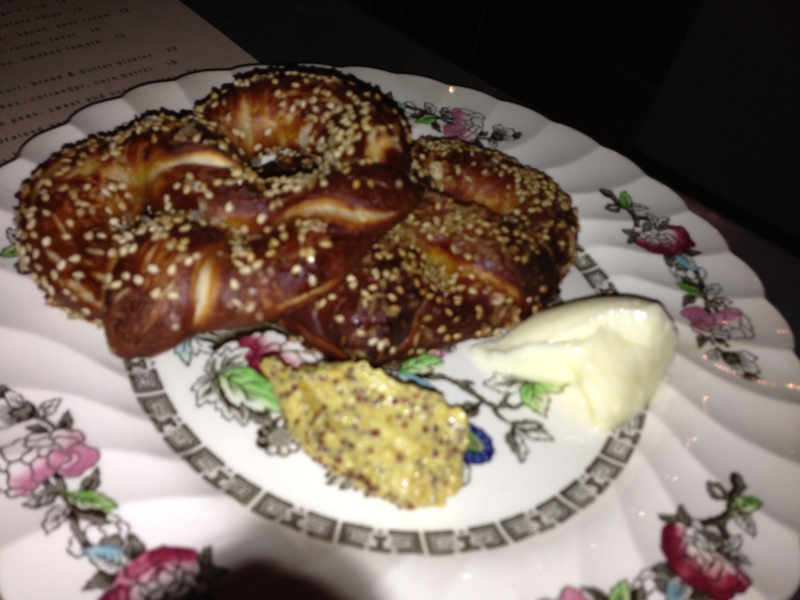 For every glass of wine or pour of Craftsman Hefeweizen, you see the outstanding hand-rolled soft pretzels, paired with whole grain mustard and smooth butter. The sesame and caraway seed dusting adds a…twist to the fluffy dough. It’s unforgettable, living up to the hype. If these were at Oktoberfest in Munich when I visited three years ago, I would’ve consumed at least five per day. It wouldn’t be a Bites of the Week without kale, right? 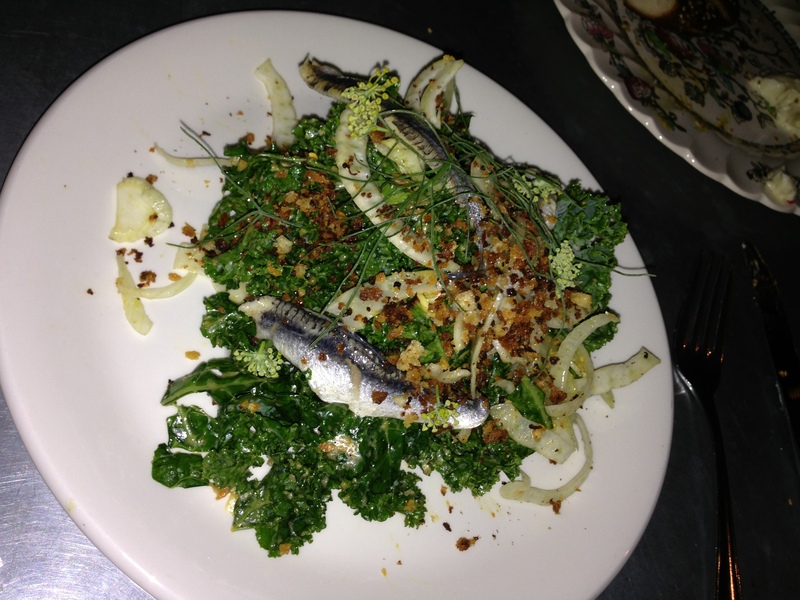 At a wine bar/ gastropub/ restaurant with a Southern cuisine influenced menu by Bill Niles, the dish to remember at the end of the night is with a whole bush of fresh kale laced with an enchanting smoked clementine dressing, topped by a few local boquerones (sardines). Even the bread crumbs aren’t just ripped from any old bread slice. This is a salad piece of art. All hail kale. This triumph of a raw fish dish from Evan Rich doesn’t follow the usual subtle, delicate playbook of most crudo/sashimi dishes. The pristine fish is topped by diced sweet Asian pear, layered as a puzzle over a dressing based on, yes, bone marrow. 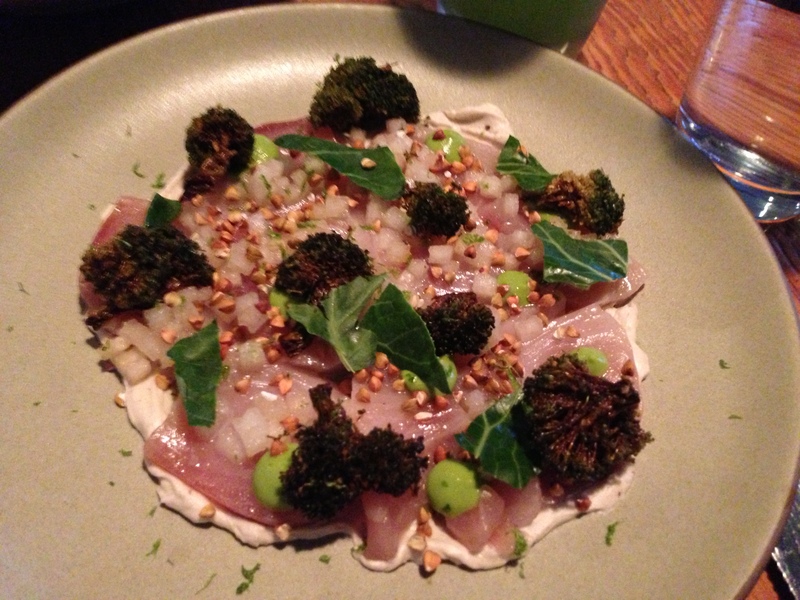 Crisp broccoli florets coated in buckwheat add an excellent textural contrast to the smoother elements. It’s a puzzle. Luckily, we just need to eat it, not piece it together. The simplest sounding pasta at Rich Table is possibly the most “comfort” sounding dish of the often deceivingly complex menu. But my oh my, with fresh peas as pea shoots, in pure structural form, and also smashed for textural contrast, then add the goat cheese and mint blasts, all tied together by idyllic al dente bucatini (thich linguine), for a second straight visit to Rich Table the pasta dishes have been the headliners. Pair it with the “Figaro Chain,” an intense ginger drink with Vodka, Averna, and gold leaf sprinkles. 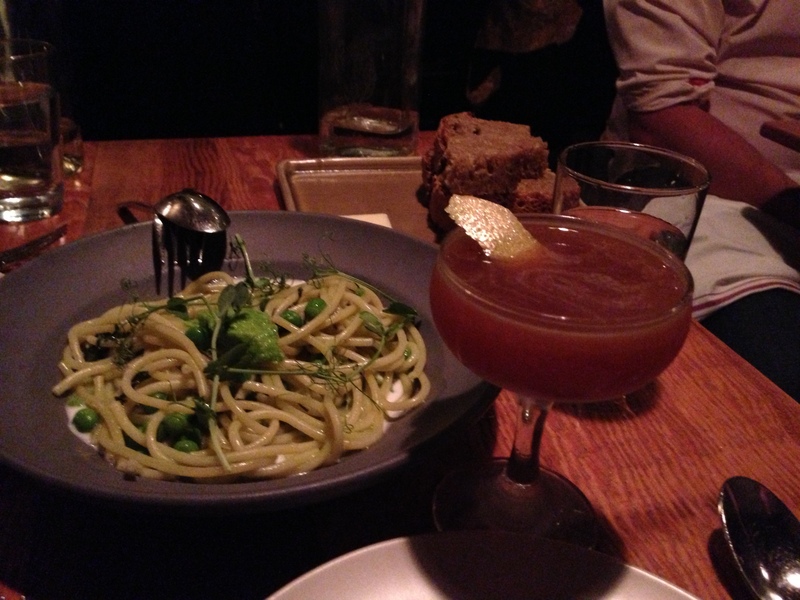 The pasta and drink are easily gold medal winners. I’m hoping if Rich Table makes a spin-off, it’ll be Italian inspired (a lot like Superba Snack Bar above). 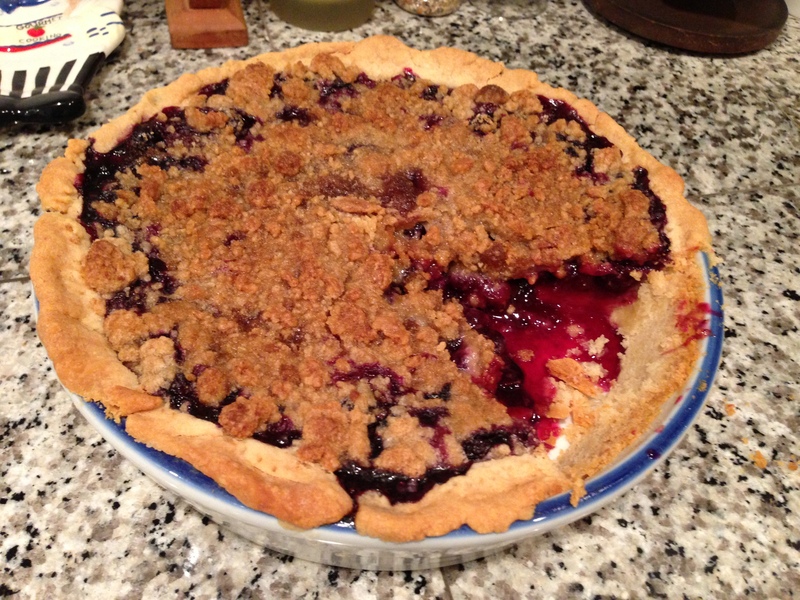 For Memorial Day BBQ’s closing note, here is the always reliably excellent blueberry crumble pie from the New York chef Rebecca Charles’ recipe. All you need is a lobster roll beforehand for New England summer perfection. Lots of butter everywhere. The recipe uses five packages of blueberries. Oh yes. What a way to start summer. 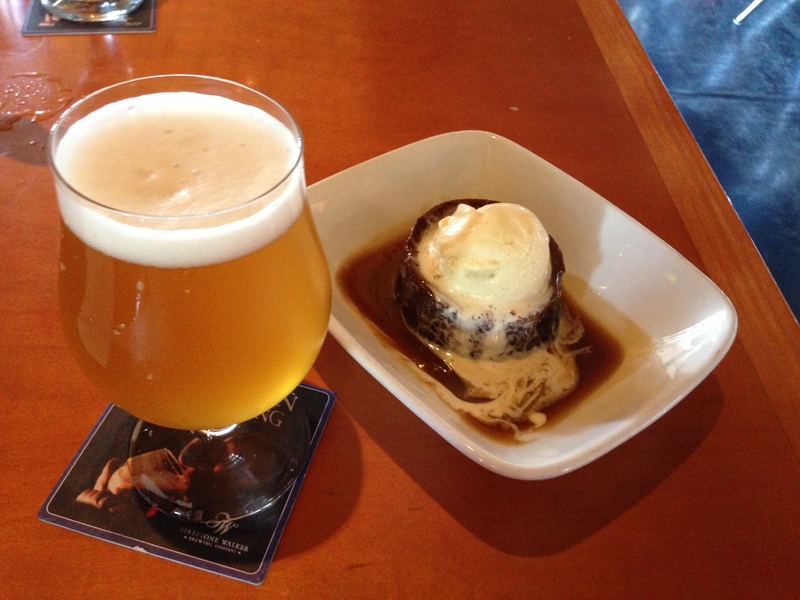 This entry was posted on June 3, 2013 by trevsbistro. It was filed under Bites of the Week, Insight .